EDINBURG — A key witness in the Mission election trial finally took the stand Tuesday, the sixth day in court, after being mentioned as a central player in the voter fraud allegations casting doubt over the outcome of the city’s June runoff election. Previous witnesses cast Esmeralda “Esmer” Lara as a politiquera who came to their homes and encouraged them cast mail-in ballots in the runoff election between former Mission Mayor Norberto “Beto” Salinas and current Mayor Armando O’Caña. Lara, a Mission school district janitor, testified she originally volunteered to work for the O’Caña campaign for no pay, but was persuaded to help the Salinas campaign during the 35 days between the general election and the runoff after being told that doing so would land her a higher-paying job with the city. Salinas was the person who originally got her a job with the school district, she said, adding she worked for him during previous elections. Lara testified that Marco Perez, a man she described as the former mayor’s “middleman,” was the one who approached her about switching sides, promising her $1,500 if she worked for both Salinas and Julian Gonzalez, the current Hidalgo city manager who unsuccessfully ran for a seat on Mission’s city council, a race that also went to a runoff. Perez allegedly assured her no one from the O’Caña campaign would find out, but things went south, according to her testimony, after she received a subpoena from Ricardo “Rick” Salinas, the son of the former mayor who is representing his father in court. Salinas, the attorney, said Lara called his father on Aug. 16 and said, “Tell your son to remove me from that f——— witness list,” an allegation Lara denied during her testimony, instead telling Judge J. Bonner Dorsey she called the former mayor because Perez, the “middleman,” stopped answering her calls. 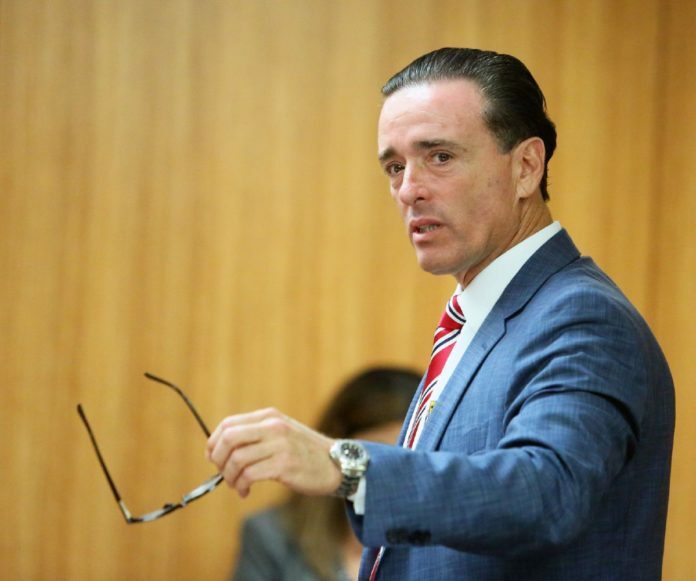 Beto Salinas also left Lara a voicemail message sent to O’Caña’s legal team after learning she’d be called as a witness in the trial, which O’Caña’s attorney, Gilberto Hinojosa, tried to enter into evidence and play for the judge. Dorsey, however, ordered Hinojosa to provide a written translation of the Spanish-language message so Salinas’ lawyers could first review it. Through his questioning, Rick Salinas cast Lara as part of a larger conspiracy to elect O’Caña — who initially fell short by 514 votes — in a short period of time by allegedly providing illegal assistance to voters casting mail-in ballots, resulting in O’Caña’s 157 vote victory in June. He repeatedly questioned her as to whether she “harvested” ballots, which she denied while on the witness stand. He also attempted to bring up Lara’s criminal history, as she was charged with 20 counts of unlawful assistance to a voter stemming from the May 2005 McAllen mayoral election, charges which the Hidalgo County District Attorney’s Office dismissed in 2008 “in the interest of justice,” according to court records. Although the attorneys finished questioning Lara on Tuesday, she may be called back to the stand at a later date in the trial. Dorsey told Salinas’ legal team that they must call all of their witnesses by noon Thursday, at which point O’Caña’s attorneys will have the opportunity to call their own witnesses.